Q. How can we encapsulate fragile and heat-sensitive items in glass such as flowers for jewelry and decorative pieces? We would like to research the feasibility of an innovative glass design. 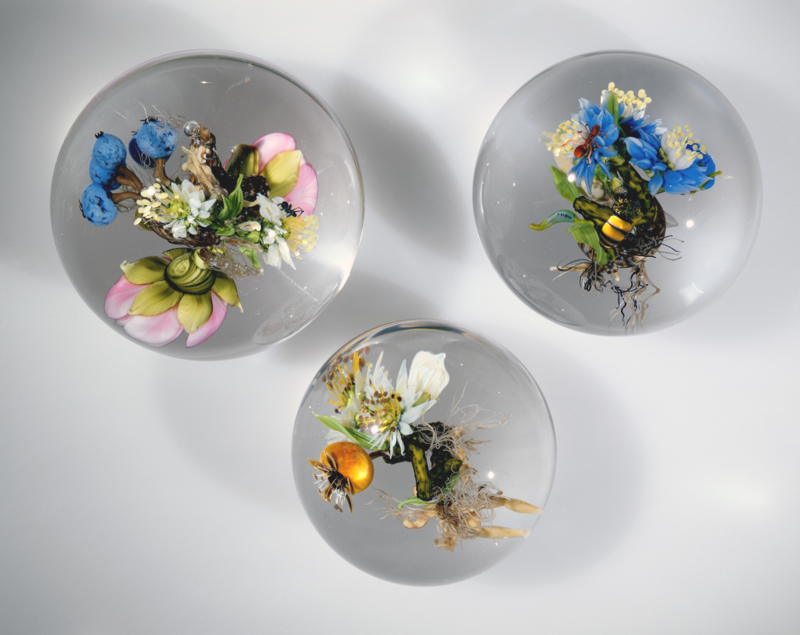 We want to encapsulate fragile and heat-sensitive items in glass such as flowers for jewelry and decorative pieces. We are reaching out to you to ask if you could please guide us towards any resources that could help us in reaching our goal. Can you think of anyone whom we could direct our questions towards? Paul K. Stankard,Mantu, NJ, 1998-1999. CMGL 105889. The hot glass needs to be in excess of 2000 degrees Fahrenheit in order to be "workable". When organic materials are added to this hot glass, they become carbon because of the heat. He mentioned flame working or lamp working as a possible method for including fragile items. Because the heat can be concentrated on the glass and kept away from the organic material, it is possible to seal the item inside of an evacuated cavity in the glass. We also discussed Donald Lipski (example of his work here) and the process he uses to encapsulate organic materials in glass. He uses lab glass and Pyrex pipe fittings to hold a solution which prevents decay of the organic inner material. Ultimately, the organic matter is suspended in the solution contained in the glass, not in glass itself. This method does not involve glass working. I am attaching two bibliographies on inclusions, such as paperweights. The titles may be helpful in your research. As far as leads for speaking with people when you are here, you can contact our curatorial department through their online form. As our Library focuses on the art and history of glass and glassmaking, it is beyond our scope to answer technical questions in detail. If you think you will want more technical materials for your research, you may wish to contact The Scholes Library at Alfred University, New York State College of Ceramics. They have a substantial collection of technical information about glass. Their reference desk number is: (607) 871-2951. If you wish to borrow copies of library items, please contact your local library. The Rakow Research Library will lend designated books from its collection and will send copies of articles requested by other libraries. Your library can request items through the OCLC WorldShare Interlibrary Loan (ILL) system or by direct request through email at ill@cmog.org. For more information, please see our ILL website.